Modular armor offers a modest increase in acid resistance over its predecessor and a notable increase in explosion resistance, but its greatest bonus comes in the form of equipment modules. The Modular armor offers a 5×5 grid that can be customized with an assortment of modules for defense, support or attack. Right click on the armor to show the equipment grid. The armor will be destroyed when its durability reaches 0, and all the equipped modules will be lost. 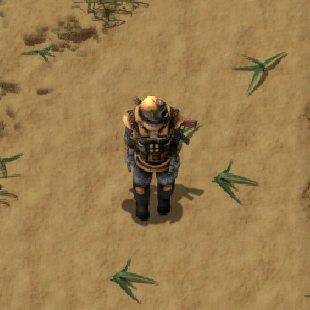 In addition, left clicking the equipped armor will pick it up and eliminate its inventory bonus, causing any items in the bottom row of the player's inventory to be spilled all over the ground.